Political cinema often goes over big at the Cannes Film Festival, to the extent that someone could probably teach a class on the subject and select nothing but Palme D’Or winners for the syllabus. Hell, in the scant two years I’ve been writing Palme Thursday, I’ve already covered films on the inequities of Italian peasant life, the rapid upheaval of the Chinese Cultural Revolution, the founding of the Solidarity movement, the horrors of Communist Romania, the follies of the Bush administration, and—metaphorically, anyway—the spirit of the 1968 student revolts in France. Google plays a big part in my process. But no amount of hours spent plugging keywords into a search engine is going to definitively settle the debate surrounding one of Cannes’ most divisive prizewinners. From the moment it took top honors at the festival, in May of 1995, Emir Kusturica’s Underground was mired in controversy. Subtitled “Once Upon A Time There Was A Country,” the film is a wild, seriocomic eulogy for a unified Yugoslavia. To its detractors, however, it looked more like an apology—or worse, propaganda—for Serbian nationalists. “Kusturica’s reconstruction, in this film of the history of the revolution and of Yugoslavia during and after World War II, has nothing to do with reality,” wrote Stanko Cerovic, Montenegrin journalist for France’s RFI radio station. He was not alone in his attacks on the film and its director, and half a year after Underground won the Palme, Kusturica announced he was so weary and sickened by these battles that he was retiring from filmmaking—an impulsive announcement he would later walk back. Some context here might be helpful. Born in Sarajevo, Kusturica quickly established himself as the cinematic laureate of Yugoslavia, and a star and national hero in Bosnia. Before he was even 40, the filmmaker had picked up major prizes at Venice, Berlin, and Cannes; his Palme for Underground was, in fact, his second, after nabbing the prize a decade earlier for When Father Was Away On Business. But by the early ’90s, when the Yugoslav Wars escalated into horrific violence (including war crimes committed by Serbian nationalists), Kusturica’s allegiance to Yugoslavia—as opposed to Bosnia specifically—made him a traitor in the eyes of his countrymen. It didn’t help that he began self-identifying, ethnically, as Serbian, or that he never spoke out publicly against Yugoslav leader Slobodan Milosevic. And so it’s probably safe to say that the backlash against this particular Palme winner grew at least partially out of resentment for the man who made it. For someone like myself, a layman on conflict in the Balkans, it’s difficult to evaluate Underground on strictly political terms, as that requires formulating a staunch, coherent position on the Yugoslavian experiment. (Give me a year and a library card and I’ll get back to you on that.) On purely artistic grounds, however, the merits of this boisterous, whirligig epic—which covers 40 years of regional history through the madcap exploits of two incorrigible scoundrels—are hard to ignore. And I have the nagging suspicion that it was through that (mostly) apolitical lens that the Cannes jury assessed Underground. What they had was the luxury of distance—an ability to judge the film from an outsider’s perspective, free of vested interest in the events it depicts. On paper, and in retrospect, the 1995 lineup looks stacked: Terence Davies, Ken Loach, Hou Hsiao-Hsien, Jim Jarmusch, Tim Burton, Manoel De Oliveira, and Zhang Yimou were all there, vying for the Palme. But from the perspective of the American media, at least, this was an off year. “As the 12 days wore on, folks spent much of their time grousing, walking out of movies, and waiting for a real winner,” Jeff Gordinier reported for Entertainment Weekly. The deflated energy Gordinier was describing could possibly be blamed on the bar set by the previous year’s festival. Folks who went in expecting another Pulp Fiction didn’t find one, though there were films of a comparatively punkish spirit. Fresh from Sundance, where it scandalized as intended, Larry Clark’s Kids provided Harvey Weinstein with another lightning rod for discussion (much to the chagrin of Jonathan Rosenbaum). And La Haine, a hellish but exhilarating portrait of life in the French ghetto, was another stylish sophomore feature from a crime-obsessed young auteur. For pure scope and verve, though, there was no competing with Underground. The version that played at Cannes—longer than the one that opened in U.S. theaters, shorter than the one that later ran on Serbian television—surpassed the three-hour mark. (Film critic Kenneth Turan suggested that it was the probable winner sight unseen, just as many did with last year’s champion, the similarly lengthy Winter Sleep.) It was not just bigger than anything else in competition that year, but louder, brasher, and maybe funnier, too. Its nearest cousin, in the apples-and-oranges competition of Cannes ’95, was Theodoros Angelopoulos’ comparatively long Ulysses’ Gaze, also set in a war-torn Balkans. But Underground passed its own hefty running time with—among other crazed sights and sounds—a chimpanzee operating a tank. No surprise, really, that the jury ended up handing a dismayed Angelopoulos the Grand Prix (or second place). Dividing its decades-spanning narrative into three distinct chapters—the first and third are both called “The War,” to underline the sadly cyclical nature of Yugoslavia’s troubled history—Underground is an audacious black comedy, comingling horror and humor at every turn. Its guiding principle, beyond a general impish embrace of chaos, is that the only way to approach so much violence, turmoil, and cultural change is through the mad mechanics of satire. For a film set in a war zone, it’s brazenly zany. The lunacy commences with the opening frames, as our “heroes”—two heavy-drinking, skirt-chasing rapscallions, thick as thieves—lead a brass orchestra through the streets of Belgrade, tossing money and firing bullets in the general direction of the musicians. Marko (Miki Manojlović, who looks a bit like Harry Shearer) is the brains of the operation, slick and cunning. Blacky (Lazar Ristovski) is more like the brawn, a hotheaded electrician prone to flairs of passion and anger. Over the film’s first hour, as Axis forces invade the city in the waning years of World War II, these crazed comrades behave like the amoral jokester crooks of a Martin Scorsese crime epic. They also wage slapstick war on the Nazi occupiers; in one daft early scene, Blacky bounds onstage during a play, infiltrating the show to shoot at the Wehrmacht officer (Ernst Stotzner) in the audience. His motives are more personal than political: The officer has his eyes on the play’s lead actress, Natalija Zovkov (Mirjana Joković), who Blacky would rather have for himself. It’s a darkly Orwellian premise: men, women, and children fighting a war that ended two decades prior, blissfully unaware that they’ve been living in darkness and seclusion for the profits of one greedy scoundrel. But Kusturica treats the underground of Underground like a kind of self-contained world—an amazingly realized alternate society, where the lights are powered by bicycles and other appliances are turned on and off through a series of levers and pulleys. Marko, who spies on his unwitting POWs through the ceiling, even warps their sense of time, adding hours to the day—and hence convincing many that they’ve been underground for 15 years, not 20—using an enormous clock that towers over their cramped community. There’s a long, mid-film wedding sequence that captures both the futility and the vibrancy of this life beneath. That entwining of light and dark, of joy and madness, is crucial to the movie’s success. Some have called Kusturica the heir apparent to Fellini, another ringmaster of noisy and exuberant carnivals. But there’s more violence in the former’s films, a deeper sadness undercutting his crazed cartoon energy. Early into Underground, when war comes to town, the Belgrade Zoo is destroyed in a blitzkrieg of fire and death—a bombing that leaves several of the animal attractions dead or dying. But it also allows for a hilarious scene of an escaped elephant slyly stealing Marko’s new shoes. (Marko is later seen furiously cleaning his footwear with a struggling feline—another oddly visceral but amusing image.) Likewise, Marko’s brother, stuttering zookeeper Ivan (Slavko Štimac), is so traumatized by the attack that he tries to kill himself. The moment is played for a kind of bleak humor, too; Marko admonishes his dangling sibling (“Always hanging yourself!”), as though failed suicide attempts were just an annoying habit. In Underground, comedy and tragedy are never out of striking distance of each other. All the while, the blare of a ragtag brass band—horns sounding constantly, violins whining in and out—drives the manic action. Kusturica, who plays guitar in a gypsy-punk band when he’s not shooting movies or winning awards, is said to have instructed a real band to play almost constantly on set; the high energy of the results may well be a byproduct. Not quite an ironic counterpoint, the music provides an appropriate accompaniment for this bonkers epic. Like the film itself, it’s rousing but also faintly deranged—the soundtrack of a world coming willfully apart at the seams. It’s also a fine audio correlative to the filmmaker’s visuals, his exaggerated angles and parades of colorful spectacle. In one of the movie’s most inspired, demented passages, Blacky stumbles upon the set of a movie based on his own misadventures, and it’s as though one fiction (the lie he fought for below ground for two decades) is colliding with another (the exaggerated stories of his heroism). 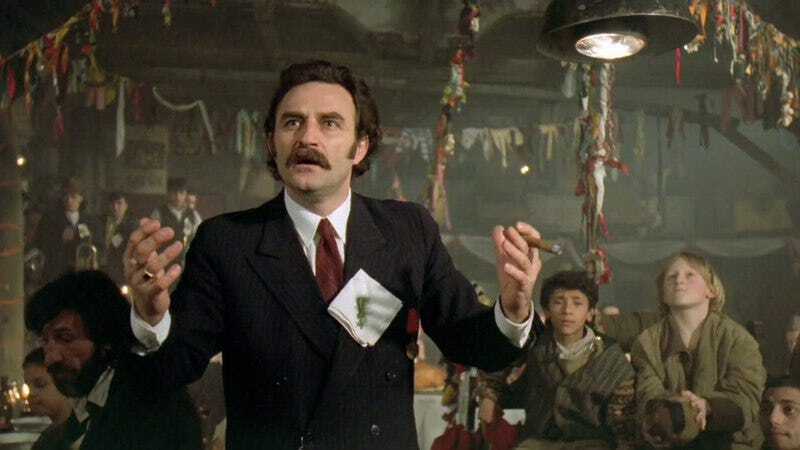 This scene, more than any other, may hold the key to what Kusturica is trying to convey: the notion that Yugoslavia, the melting pot of cultures and ethnicities he believed in, was never more than an idealized fiction itself. Notably, the director, afflicted with what many have described as “Yugonostalgia,” spends a lot of his downtime in a kind of imaginary world—a model Balkan village he had constructed in the mountains of Serbia. Whether Kusturica made Underground in support of the Serbian cause is not for me to say, nor am I inclined (or qualified) to dismiss those who object to it on those grounds. There is, however, an ambivalence to the movie, especially in its harrowing final minutes, that the detractors seem to willfully ignore. Are any of these characters, especially our main ones, the lovable Serbian heroes Cerovic describes in his hit piece? Blacky, who assimilates into the Serbian nationalist army after the start of the Yugoslav War, becomes an insane death dealer—a genocidal tyrant, at one point seen chasing an enflamed wheelchair (a symbol of the atrocities committed during the conflict). Anyway, regardless of underlying allegiances, Underground possesses an eccentric power—a potent blend of tones, a real vision—independent of its specific cultural context. That, I’m guessing, is what the jurors at Cannes really responded to. And 20 years later, were they to sit down and take another vote, I’m guessing they’d respond to it all over again, even if the terrible conflicts the film depicts have disappeared from headlines and front pages. Did it deserve to win? I’ve only seen the shorter, U.S. theatrical release of Underground, but that’s more than enough to declare it an acceptable winner—for its ambition, for its grotesque humor, and for that aforementioned image of a chimp in a tank. Three viable alternatives: Jim Jarmusch’s deadpan Dead Man, an off-kilter oater for the ages; Tim Burton’s greatest film, Ed Wood, which opened a few months earlier in America and thus didn’t factor much into the festival conversation; and the crackerjack La Haine, featuring a young, ferocious Vincent Cassel.